Target has done it again…in more ways than one. Anyone remember the fiasco that was Lilly Pulitzer at Target in April 2015? I’m still salty over how that went down, so ever since then I’ve started to check the day before a Target.com launch to see if the items from special lines are up early. And it’s all online. Today. September 15 at 11 a.m. 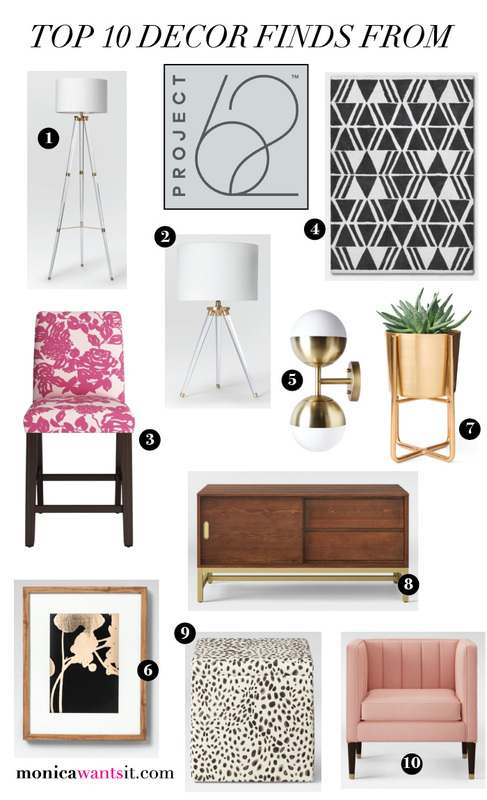 I snagged both numbers 1 and 2 from my top 10 picks from the line below (because helloooo lucite and brass lamps for under $100), and I personally looked through all 33 pages of items to pick my top 10 home decor picks. They range from $28-$260, but I feel the prices are spot on for how on-trend the items are. You’d definitely pay more at HomeGoods and West Elm, so if you see something buy it now. There’s also an extra 15% off some furniture and rugs, including those from this new line. Happy Shopping! Affiliate links to each item are below the image. These are awesome finds!!! Aw man they need to just take all my money now! I've been eyeing that blush chair, but the blue version. Happy to see it's out. I'm going to wait on ordering (I'll need 2) and see if they still have it once I close next week. Maybe it will be a sign, haha.